It’s official. 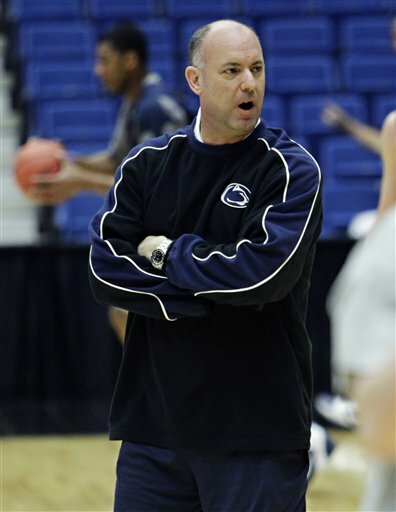 Navy has confirmed that Penn State men’s basketball coach Ed DeChellis, who guided the Nittany Lions to the 2009 NIT title, will leave his alma mater to become the new men’s basketball coach at Annapolis. The reports started creeping out Monday afternoon from a variety of outlets, including The Patriot-News of Harrisburg (Pa.) and ESPN. DeChellis built a middling program at what is a football school. Let’s face it, football will always be No. 1 in the pecking order in Happy Valley, at least as long as Joseph Vincent Paterno walks among us mortals. But it’s still an interesting move. And it comes a few months after Penn State announced it was starting a varsity hockey program — and with the bucks being invested in that venture by new Buffalo Sabres owner Terry Pegula, basketball was likely to go further down the pecking order. Still, as David Jones writes for The Patriot-News, it is a shocker. DeChellis went 222-232 in eight seasons at Penn State. But his teams were uneven. The Lions made the NIT in 2006 and 2009 — including in that latter year a late game surge against George Mason to send the game to OT, a game Penn State won. The Nits did make the NCAA tourney this year, losing to Temple in the first round of the West Regional. But it seemed like every up year was followed with one, or two, down ones. This Penn State alum won’t go on much more, but the hire — DeChellis replaces Billy Lange, who resigned May 9 to join Villanova’s coaching staff — is interesting, to say the least.